Legering is the method of fishing using a weight to keep bait on the river bed or deep in stillwater. Float fishing allows the bait to drift or move in the current of water. Legering tends to hold the bait in the same area. However when used in large rivers the leger (weight) will shift downstream. This is called a rolling leger and can be an effective method of catching fish. Rolling legers work well where the riverbed is sandy. In rocky streams or weed filled rivers a rolling leger often becomes snagged or tangled. Legers come in different shapes and weights. The simplest and lightest kind of leger is a swan shot that is merely pinched onto the line. There are legers called bombs that have a built in swivel. The swivel allows the line to be pulled through freely without the fish feeling any resistance. Heavier legers are preferred when using dead bait to catch large pike or catfish. A swimfeeder is a celluloid tube with holes. There is a weight inside the swimfeeder so it can be used as a leger. 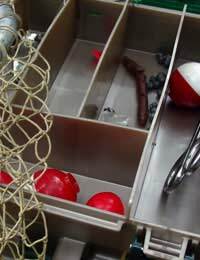 Maggots or other bait are put into the swimfeeder and attached to the line near the hook. In the water bait is released through the holes which will attract fish to the baited hook. Swimfeeders are popular for roach fishing in stillwaters. For many anglers, a fast flowing river is the ideal place for using a swimfeeder because the constant flow of water releases a steady supply of bait to waiting fish. Specialist carp anglers will leger using a strong rod to deal with heavy fish. Similarly, the pike angler will rely on the rod being sturdy enough to cast a dead bait and to land a large fish. For the angler trying legering for the first time, the tackle needn't be too expensive or complicated. Choose a general-purpose rod about 4 metres long. This kind of rod is light and flexible and will twitch beautifully when a fish is interested in the legered bait. A fixed-spool is the popular choice for the majority of anglers. The fixed-spool reel is easy to use and comes in various sizes to accommodate different amounts of line. Put line of breaking strain 5lbs on the reel. Try a small bomb for a leger or if fishing on slow or stillwater just nip on swan shot for weight. The size of hook normally depends on the size of bait and size of fish being hunted. Legering for chub with slugs or cubes of luncheon meat will require a hook of size 6 or 8. If maggots or casters are being legered for roach and dace then hooks of size 14 or 16 are adequate. Lobworms dug from the garden and redworms found in compost heaps are good bait for leger fishing. Sweetcorn, cheese and bread crust are also worth a try. Use barbless hooks because they cause less damage to the fish and are easier to use when unhooking your catch. Try legering in places under overhanging trees. Many species of fish choose these kind of places because natural food falls onto the surface from the branches and leaves. If you tackle away from your chosen spot and then approach without creating too much movement and vibration, chances are the fish will be at the water's edge! After casting out the leger, hold the line between finger and thumb. This is called touch legering and gives a direct indication of a bite. Don't strike too soon when using lobworm as bait. Fish sometimes pull at the tail so be patient and wait a few moments.